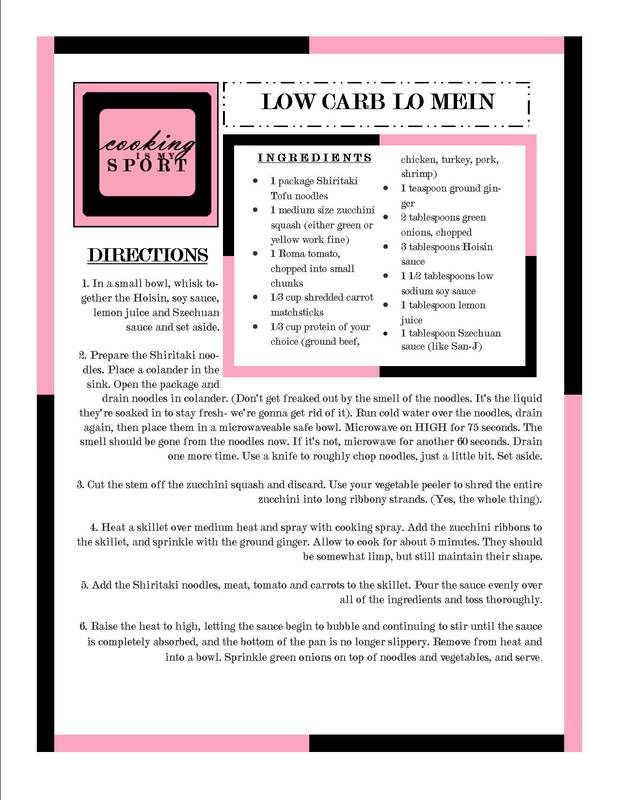 I’m gonna start this off by saying I am very, very, VERY proud of this recipe. I’m blowing/blasting my own horn here, and I don’t mind admitting it. This dish is one of the reasons why I love to experiment so much in the kitchen, why I love buying kitchen gadgets (or borrowing them from my mom) and why I firmly believe that cooking IS a sport that the more you practice at, the better you’ll get. When I first started learning how to cook, making something like this wouldn’t have even crossed my mind. I probably would’ve been afraid of using the ingredients (more on that later), or at the very least, messing the whole thing up. But that’s the beauty of practice and progress, because here we are, and now I get to share this awesome recipe with you guys (and it IS awesome). I know of very few people who don’t like Asian takeout style lo mein. For those who have never tried it, or don’t know what it even is (?!!! 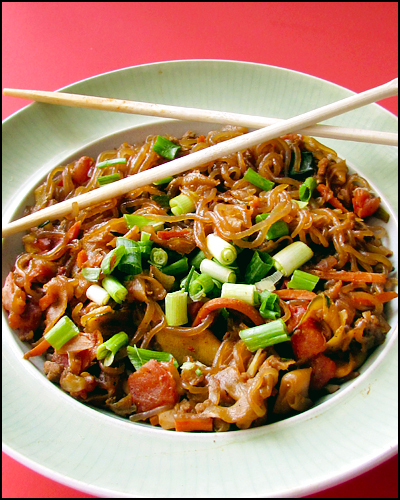 ), lo mein is basically just noodles and vegetables that have been stir fried in a zesty, Asian style sauce. If that sounds delicious to you, it’s really just because well, it is. What’s not to like about it? It’s typically served as a side dish at most major chain Asian restaurants, but I actually like eating it as a main course with egg rolls on the side. I even use it as a kind of litmus test of whether or not I’m going to like the rest of the menu at the place- if they make a good plate of lo mein, then I’ve found 9 times out of 10 that the rest of their food is pretty good too. So what’s the catch? It’s probably pretty obvious to anyone who’s ever had it before. 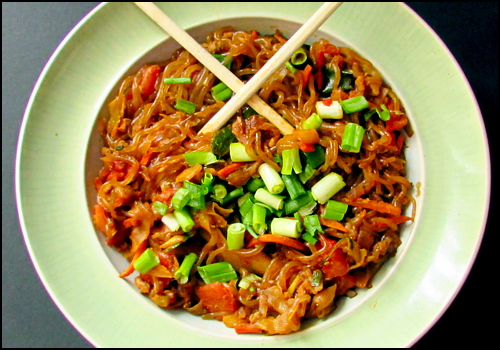 Lo Mein, (along with the majority of the other dishes at Asian restaurants) tends to leave that heavy, bloated, ‘food-baby’ feeling in your stomach that none of us like too much. It’s pasta based, so it’s carb-heavy, but there’s also the likely chance that it’s marinated in high sodium soy sauce then pan fried in peanut oil. And then (because I just have to say it), there are probably some other ‘questionable’ ingredients in the noodles that may have familiar names of normal animal proteins but don’t taste very….normal. You know what I mean. So what’s the solution to the negatives of lo mein? No, you don’t just have to ‘suffer’ from the food-baby stomach when you eat it. (Although if you do end up getting Chinese take-out, taking 2 activated charcoal pills will ease the discomfort it brings. Don’t ask how I know that.) Don’t worry, you’re not going to give it up completely either. That would be all kinds of stupid and just wouldn’t make any sense. Relax, guys. It’s not a joke. There really is NO pasta in this dish. It really IS low carb. The ‘pasta’ in this lo mein dish comes from two ingredients: zucchini squash, and Shiritaki noodles. How did I do it? I’m glad you asked. The zucchini, I shredded into what are called ‘ribbons’ with the help of a standard hand-held vegetable peeler that you can probably get at any major department store or multi-purpose grocery store where they sell kitchen gadgets. It’s pretty inexpensive and gets the job done just fine. Now guys, I’ve said it before and I’ll say it again: please, PLEASE do not let the tofu scare you away from this recipe. I know that when most of us hear the word ‘tofu’ we instantly think of ultra-bland, ultra-nasty food that only health-nuts and fitness fanatics eat. (Or maybe you think of that Doug episode on Nickelodeon, I don’t know). But coming from a girl who has a genuine appreciation for her carbohydrates (that includes bread, pasta, etc), I promise you: these do taste JUST like the real thing when cooked properly. I’m serious. Don’t worry, the recipe will have all the details you need to prepare them the right way. It’s not complicated at all, and the result is just SO worth it. Think about it; you’re not really eating anything but vegetables, tofu, and meat (which I’ve even gone without sometimes). You make this for your family without telling them the ingredients, and they’re not going to know the difference between this lo mein, and the original. That’s how good this is. The only real difference they may notice, is that they don’t have a bloated food-baby after eating it…and there’s absolutely nothing wrong with that. FEED(ME) BACK: Name one ingredient that you’re slightly (or even very) nervous to cook with for the first time. 1. In a small bowl, whisk together the Hoisin, soy sauce, lemon juice and Szechuan sauce and set aside. 2. 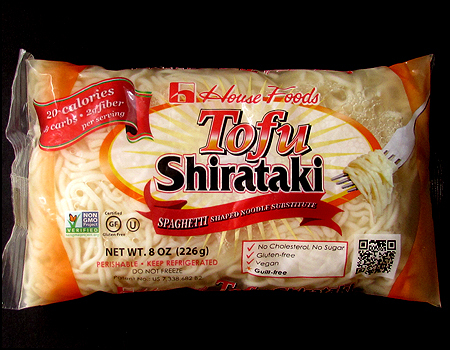 Prepare the Shiritaki noodles. Place a colander in the sink. Open the package and drain noodles in colander. (Don’t get freaked out by the smell of the noodles. It’s the liquid they’re soaked in to stay fresh- we’re gonna get rid of it). Run cold water over the noodles, drain again, then place them in a microwaveable safe bowl. Microwave on HIGH for 75 seconds. The smell should be gone from the noodles now. If it’s not, microwave for another 60 seconds. Drain one more time. Use a knife to roughly chop noodles, just a little bit. Set aside. 3. Cut the stem off the zucchini squash and discard. Use your vegetable peeler to shred the entire zucchini into long ribbony strands. (Yes, the whole thing). 4. Heat a skillet over medium heat and spray with cooking spray. Add the zucchini ribbons to the skillet, and sprinkle with the ground ginger. Allow to cook for about 5 minutes. They should be somewhat limp, but still maintain their shape. 5. 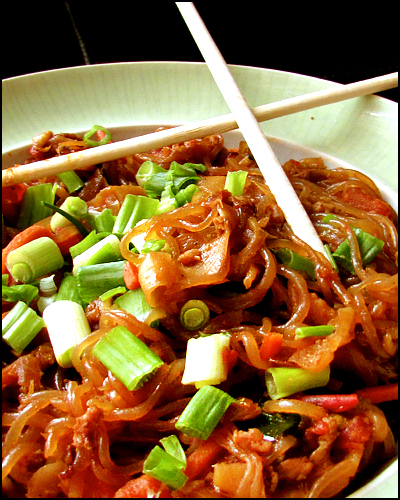 Add the Shiritaki noodles, meat, tomato and carrots to the skillet. Pour the sauce evenly over all of the ingredients and toss thoroughly. 6. Raise the heat to high, letting the sauce begin to bubble and continuing to stir until the sauce is completely absorbed, and the bottom of the pan is no longer slippery. Remove from heat and into a bowl. 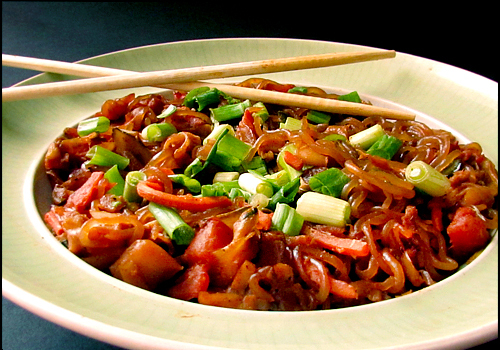 Sprinkle green onions on top of noodles and vegetables, and serve. Looking forward to trying this!! Feeding you – fresh tuna, Bought it once and only once to cook. It smelled like wet dog. it was putrid. Ten dollars down the drain plus sadly wasted fish. I’ve seen it frozen in Costco too. Walked past. Looks very delicious! I never even hear about tofu noodles.